Check out the film's 25th anniversary Blu-ray art below. Alan Parker’s 1991 film “The Commitments,” based on a book by Roddy Doyle, follows aspiring music manager Jimmy Rabbitte (Robert Arkins) who desperately wants to form a soul band. Starting with his friends Outspan (Glen Hansard) and Derek (Kenneth McCluskey), he begins holding auditions in his parents’ house and assembles a band out of young upstarts. Rabbitte soon whips the members into shape and they come together on stage and perform to captivated crowds, but the members’ egos eventually get in the way of further success. The film was a critical and commercial success, winning four BAFTA awards, including Best Film, and was nominated for an Oscar as well. Now on its 25th anniversary year, RLJ Entertainment will release “The Commitments” on Blu-ray for the first time. The Blu-ray will feature a brand new interview with Parker and cast members Arkins, Hansard and McCluskey, along with Parker’s audio commentary, a music video for “Treat Her Right,” and a making-of documentary. Alan Parker’s diverse directorial oeuvre spans many genres and modes. His films include gangster movie “Bugsy Malone” featuring all child actors, “Midnight Express,” about Billy Hayes’ time spent in a Turkish prison, the musical “Fame,” “Pink Floyd–The Wall,” and “Mississippi Burning,” which was nominated for seven Oscars. His last film as a director was “The Life of David Gale,” about a long-time opponent of capital punishment sentenced to death for murder. 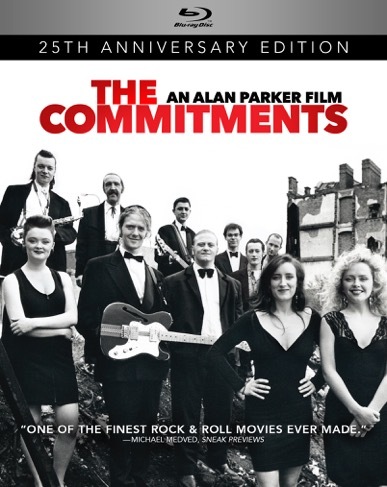 “The Commitments” Blu-ray will be released on August 30th. Check out the art for the Blu-ray release below.